Location : Capri , Sunnydale and Glencairn Valley. Organiser: Ronnie Glass –cell 083 44 16 17 0. Getting to the Farm: Address -71, Capri Drive, Capri, Sunnydale. Travel South over Ou Kaapse Weg. At the bottom pass the Chapmans Peak turnoff on your right, proceed straight through the first robots at the Buller Louw intersection. At the second (major) set of robots – the Kommetjie Road intersection- turn right (M 65) towards Kommetjie. At the next set of robots turn left into Capri Drive. Travel the full length of Capri Drive until the tar stops. On the left is the gate .You will see the farmhouse at the end of the gravel driveway (150 metres.) Please park outside and walk. If you have difficulty walking phone Ronnie in advance to arrange as limited parking is available. If the gate is closed call Trish on 082 492 3942 or Ronnie to be let in. Travel safely. We will be welcomed by Trish Wood, whose family have owned the farm houses and immediate surrounding area for many years. 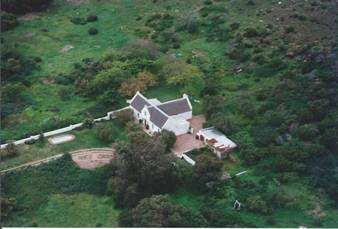 The original farm was once the major farm in the Fish Hoek Valley and extended across the valley. 25 years ago Trish decided to restore the main farm buildings. Ivan Flint was the architect responsible and Ivan and Trish will present a show in the Voorkamer , of the photos taken at the time of the restoration. After the main house exploration, we will visit 2 outbuildings, one restored and one waiting for Trish’s son to do so. Thereafter the perennial spring-yes its still flowing despite the lack of rain, and then the graveyard. We will enjoy our picnic lunch on the front patio. Bring chairs. The easiest is to fetch the lunch from the cars at lunch time. After lunch (shortly before 2pm) we drive back along Capri Drive and then turn right into Kommetjie Road towards the major intersection. Turn right at the intersection onto the Glencairn Freeway (M6). Travel until the robot intersection with the Main Road (M4). Turn right. Then first turn right into Glen Road. Pass the hotel on your left. Continue with the wetland on your right. At the end of the wetland are the 2 buildings of the St Andrews Church on your right. We meet our guide, Paul Jacques, in the second building, where Paul will share with us his research into the nearby watermill as well as his informative computer reconstruction thereof. Thereafter we will walk to the nearby ruin of the mill. This will conclude the day’s outing. On your return journey the wetland is worth a visit and paths have been laid out. There is also the Hotel for those with parched throats or tired feet! 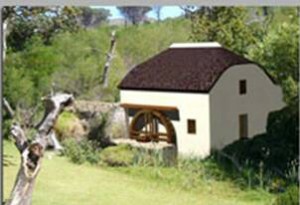 Sunnydale Farm (formerly Poespas Kraal) was one of four land grants made simultaneously in 1743. De Noordhoek, Slangenkop (Imhoff’s Gift) and De Goede Gift were granted to Christina Diemer and Poespas Kraal to George Wieser. Christina Diemer was the widow of Frederik Russouw of Zwaanswyk (Steenberg). The De Noordhoek grant is commemorated by a tiled mural on the old Noordhoek Post Office in Village Lane. Poespas Kraal was 30 morgen [26 ha] in extent and was bought and developed by Johannes Bruins on 8 June 1759. 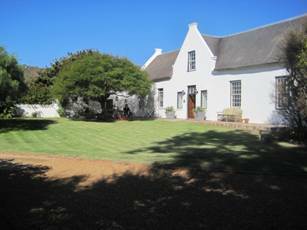 Bruins (Andries Bruins’ father) is credited with having built the gabled homestead c1760 which is beautifully maintained and tucked away out of sight in today’s suburb of Capri. The former slave quarters was once a restaurant in which the original stonework was displayed. The homestead is one of four Provincial Heritage sites in Fish Hoek Valley. Subsequent owners include Jones (1824). In that year the Fiscal reported that for tax purposes Mr I.N. Jones had at the farm: 1 x man; 1 x wife; 4 x sons; 4 x daughters; 2 x Hottentot males under 16; 1 x Hottentot female under 20; 1 x Hottentot female over 20; 5 x riding horses; 10 x oxen; 60 withers; 25 x goats; 695 Morgen of land; barley and oats. Tax due: £19-3 shillings. In more recent times Sunnydale Farm was sub-divided into various lots and one lot-holder was Buller Louw who had a dairy herd, an abattoir and a road-side shop. Nicknamed Louw’s Corner, this famous shopping landmark was located at a point just short of the turn off to Noordhoek/Chapman’s Peak on the M64. Louw sold out to developers and the complex was demolished to make way for Sun Valley Mall in the 1980s and later Longbeach Mall. Sources: Hans Fransen and Mary Cook; Audrey Read. Malcolm Cobern. PLEASE NOTE: OUTINGS ARE FOR PAYING VASSA MEMBERS ONLY! Don’t forget to wear your VASSA badge at outings. TO JOIN VASSA: Simply click on the orange Join VASSA button on the right and follow the prompts.